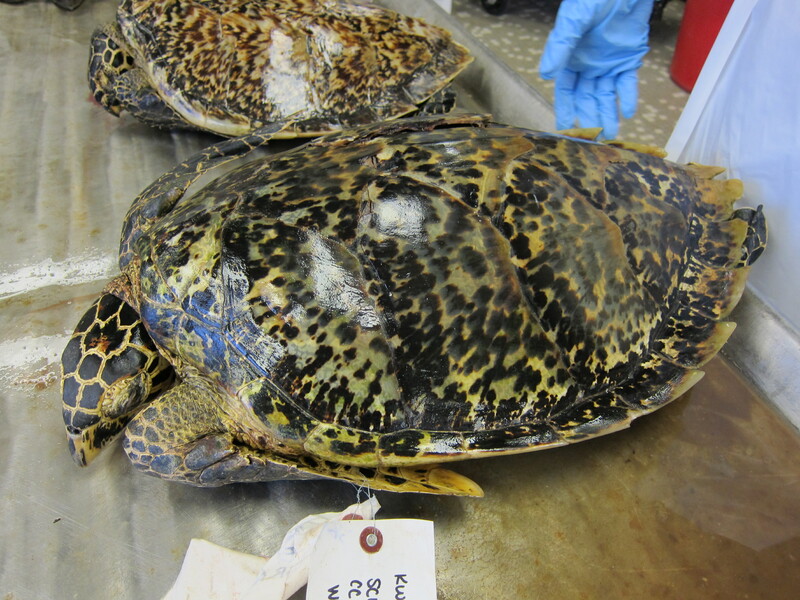 What began as research into historical data on rare hawksbill sea turtles could help illuminate the shadowy modern world of illegal, unreported, and unregulated fishing, according to a new paper published in the journal Science Advances. The study also revealed that a dramatically larger number of the critically endangered turtles were killed for the tortoiseshell trade, six times higher than earlier estimates. The project started nearly a decade ago when Dr. Kyle Van Houtan — then with the National Oceanic and Atmospheric Administration, now Monterey Bay Aquarium’s director of science and senior author of the paper — was leading a sea turtle research program in Hawaii. “Our goal was to give hawksbills the attention they deserve,” Kyle says. “Hawksbill sea turtles are critically endangered throughout their range, mostly due to threats from illegal harvesting.” The turtles can grow to more than three feet long and 150 pounds and are distinct for their beautiful, mottled shells. “They also have a long slender neck that allows them to search for food in the cavities between branches of coral in a reef. There they find sponges, algae and other invertebrates,” Kyle explains. “They can really shape a coral reef, allowing coral colonies and the reef ecosystem to thrive,” says Dr. Emily Miller, assistant research scientist at the Aquarium and the paper’s first author. 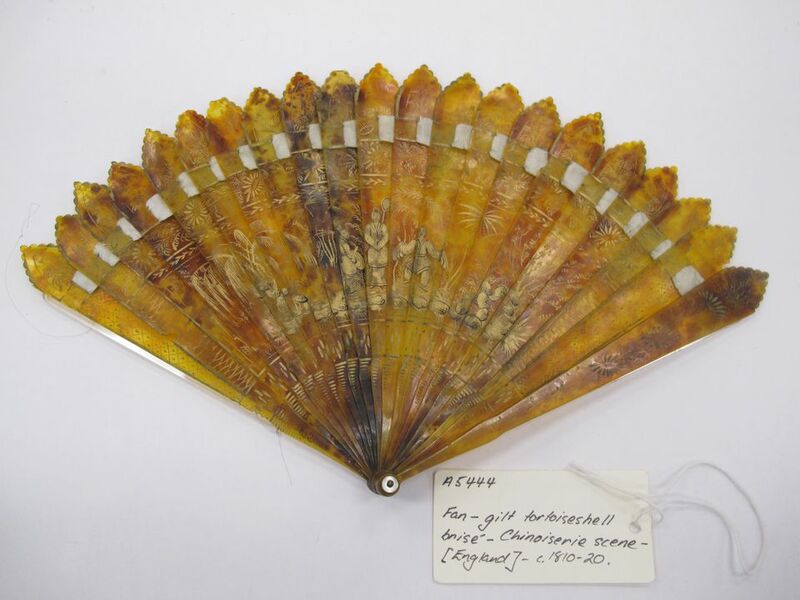 Ornamental objects, like this British-made fan, were crafted from the scutes of hawksbill turtles. Photo courtesy Museum of Applied Arts and Sciences. Recent estimates put the number of nesting female hawksbills at fewer than 25,000 individuals worldwide. Because their meat can be poisonous, they’re often not caught for food, but rather for tortoiseshell — a word Emily calls a misnomer, since the prized material is produced from hawksbill turtles, not tortoises. For thousands of years, tortoiseshell has been crafted into items from fishhooks to bracelets, letter openers and combs. It’s translucent — as though the turtles swim around with a jewel on their back. “That beauty has been their curse, unfortunately,” Emily says. 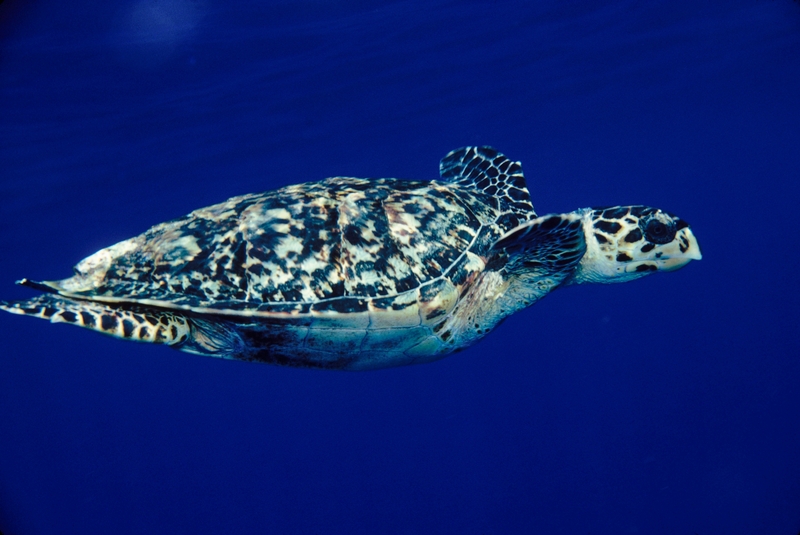 Until now, the best analysis of hawksbill numbers over time relied on data that only went back to 1950. To better understand why hawksbills are so rare today, you need more information — a way to look further back in time. Science Director Dr. Kyle Van Houtan previously led a sea turtle research program in Hawaii. That’s Dr. Loren McClenachan’s specialty. A historical marine ecologist at Colby College in Maine, Loren and Kyle are longtime research collaborators. In this case, the team saw an opportunity to use archival import records from dozens of countries, some dating back as far as 1844, to get a better harvest estimate for hawksbills. “We knew the lion’s share of the trade revolved around Japan, as there have been dedicated artisans for centuries who work the tortoiseshell — there known as bekko — as a semi-precious jewel,” Kyle says. But aggregating those customs records proved a hefty task. The team spanned several continents, multiple years, and hundreds of pages of published and unpublished historical trade data. Kyle connected with Yoshikazu Uni, a research colleague from the Tokyo University of Agriculture, who went into Japanese archives and transcribed all the raw tortoiseshell trade records into English. Kyle and Loren hired undergraduate students who both built and then curated a single database. Loren’s team went over all the records and corrected for re-export, to avoid double-counting. Thanks to this enormous, meticulous effort, they were able to see much further back in history. The team then had to translate that data to biology, Kyle says. “An import record would say: ‘from the Solomon Islands, the year 1876, to Japan, 1800 kilos of shells.’ But we didn’t know how many turtles that meant.” A kilo of tortoiseshell might signify one adult or several juveniles. So Kyle made his own measurements using hawksbill shells — many seized by law enforcement agencies. The result: Emily had considerable detail to help model the hawksbill population over time. The new modeling indicates hawksbills were exploited on a scale far greater than previously thought: around 9 million were killed for their shells. Averaged over 150 years, that represents some 60,000 turtles annually — more than twice the estimate of all nesting females alive today. Emily also mapped the top tortoiseshell exporters. She found that Indonesia, Fiji and Thailand together account for about half of historical exports. Maps of historical tortoiseshell trade routes mirror those for modern IUU fishing. This couldn’t be explained solely by which countries had the most hawksbills living in their waters, or the largest areas to fish, Emily says. Rather, this parallels a present-day map of hotspots for illegal, unreported, and unregulated (IUU) fishing. “That turtle exporting patterns and IUU fishing patterns overlap so strongly and are concentrated in Southeast Asia means that social and economic factors are driving these patterns,” explains Emily. This animation shows how global tortoiseshell trade diversified over time. Arrows move from source to destination country and are proportionate to number of individual turtles traded. Indeed, the international tortoiseshell trade map of centuries past may have established the groundwork for modern IUU fishing patterns, Kyle says. Insights into IUU fishing matter partly because it often accompanies a host of other unsavory enterprises. Emily notes this also means individuals can help hawksbills, and not just by refraining from buying tortoiseshell products while they’re on vacation. “Because wildlife trafficking is linked with IUU fishing, an action that might have an even greater impact is to buy sustainably sourced seafood from a vetted supplier,” she says, in order to steer spending away from potential tortoiseshell traders. Doing so might just help keep a beautiful hawksbill shell where it belongs: on a living animal, swimming free on a coral reef. 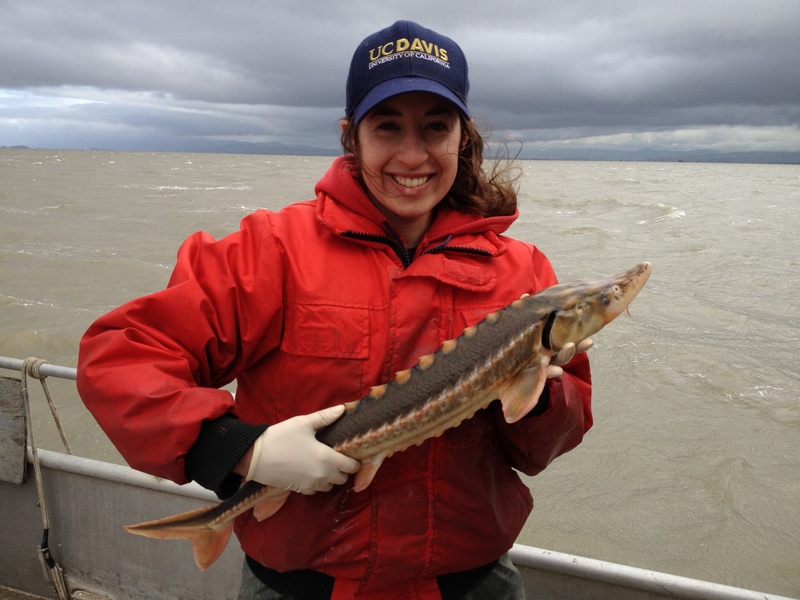 Learn more about the marine science research and policy programs at the Monterey Bay Aquarium.